Just in time for the holidays! We’ve put together the perfect holiday gift pack for all you beer lovers out there. 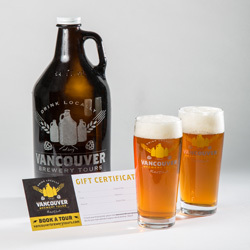 For a limited time only, this package includes 2 seats on our popular weekly Vancouver Brewery Tour ($160 value), and while you’re on tour we’ll buy you a 64oz growler filled with a beer of your choice from any of the breweries you visit on tour that day AND you’ll also leave with 2 VBT beer glasses. Once purchased, you’ll receive an email from us within 24 hours containing a printable gift certificate, booking coupon code and instructions on how to book the tour. Select Buy Now to get yours today!